A man has been charged in connection with a large explosion at a block of flats which injured three people. The blast on 23 February in Whitchurch Lane in Hartcliffe, Bristol caused significant damage to two buildings. James Gerald Toogood, 35, of no fixed abode faces a charge of arson with intent or being reckless as to endanger life. Magistrates released him on conditional bail to appear before Bristol Crown Court on 15 April. Following the incident, Avon Fire and Rescue said the blast caused "significant damage" and "appeared to be a gas explosion". One witness said she heard a "humongous bang" before her partner rescued a man on fire from one of the properties. 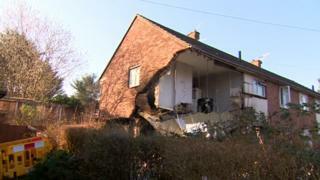 Another said the "whole house fell in". Several roads were closed and residents in neighbouring properties were evacuated from their homes.